This article describes 4 questions about your data that you can use Thematic to answer. To follow along with your own data open a data set's analytic tools using the Analyze drop-down menu. What are the most mentioned themes in my data? 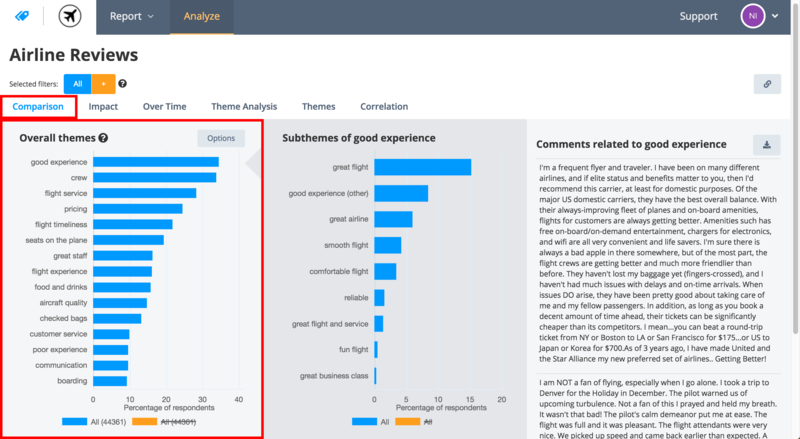 Use the Comparison analytic tool to view the 15 most mentioned base themes in your data. Responses can be tagged with one or more base and sub-theme. What are the most mentioned sub-themes in a base theme? Base themes can contain smaller more specific sub-themes, to view them click on a base themes name in the Comparison tool. The sub-themes will be displayed in the adjacent bar graph. What themes are having the most impact on my score? If your data contains a response score (ie. NPS or CSAT) Thematic can calculate which themes are having a positive or negative impact on your score. 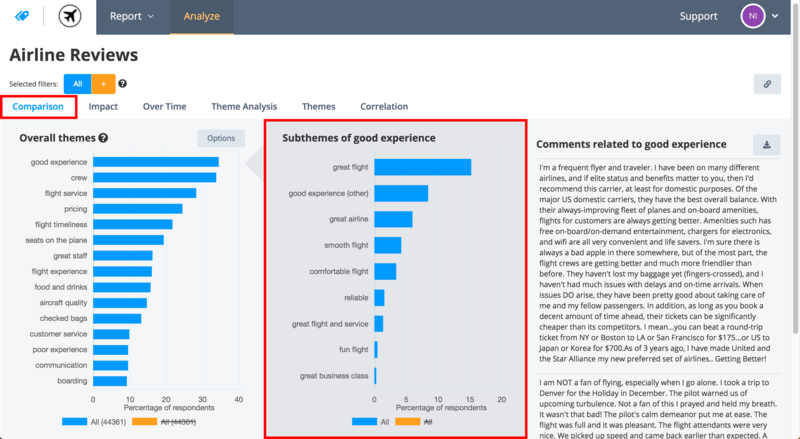 Use the Impact analytic tool to view the 15 base themes with the biggest impact on your response score. How has a themes frequency & impact changed over time? If your data contains dates (ie. Date of survey completion) Thematic can show the change in a themes frequency over time. If your data also contains a response score (ie. NPS or CSAT) it can also show the change in impact over time. Use the Theme Analysis tool and select a theme using the two searchable drop-down menus. 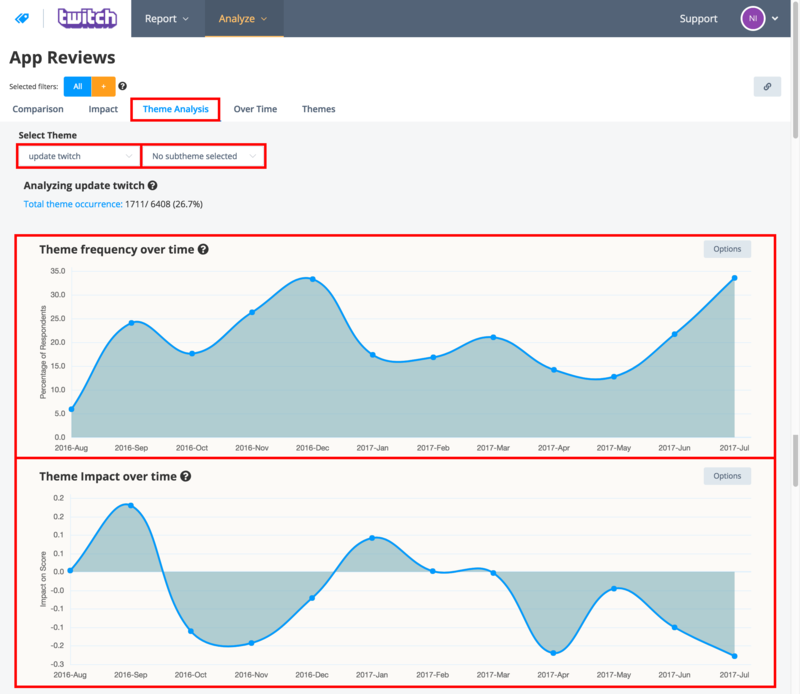 Scroll slightly down to see a theme frequency and a theme impact over time graphs. 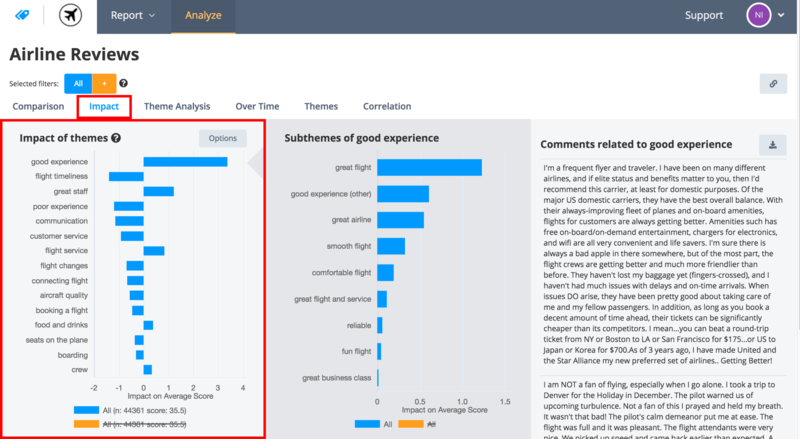 You can share any of the graphs by taking screenshots or one of these methods and if you'd like to discover more in-depth and complicated insights read the article Advanced tips and tricks for finding and sharing insights.